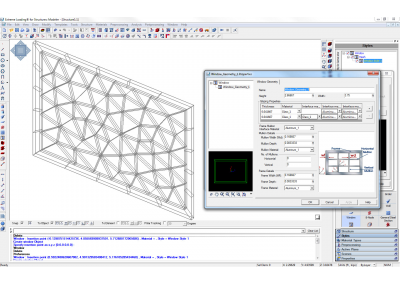 The modeler included with Extreme Loading® for Structures (ELS) provides engineers with a comprehensive and intuitive style-based modeling interface that allows users to quickly and easily create 3-D solid element structural models for nonlinear static or dynamic analysis structures. ELS automatically connects elements through their faces, without the need for transition element to match up nodes. Model custom reinforcement bars, variably spaced stirrups, and steel sections. Create custom names for reinforcement bars styles custom names and import/export databases for bar sizes. Element connectivity is generated automatically by the program without user-intervention. 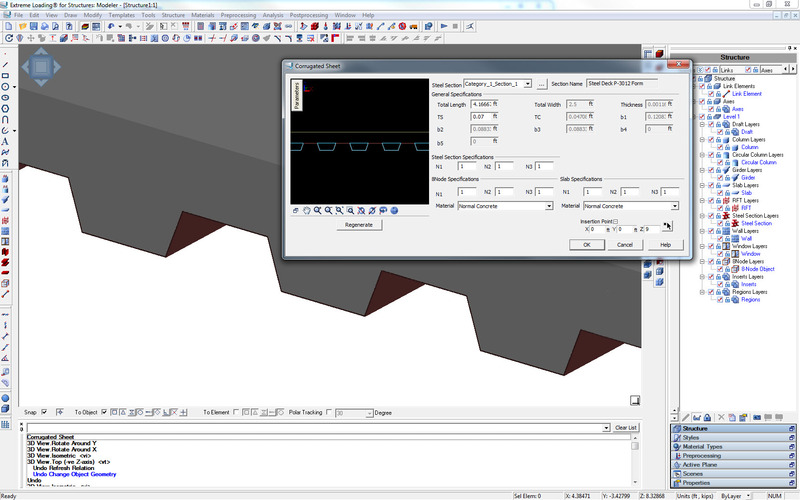 Re-meshing to create transition elements is not required. 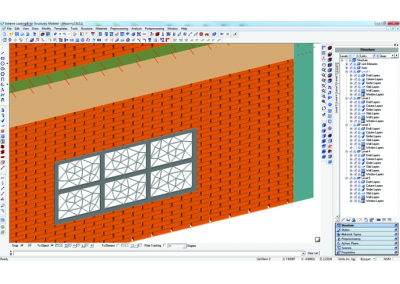 Easily model staggered masonry with different materials for bricks and mortar. 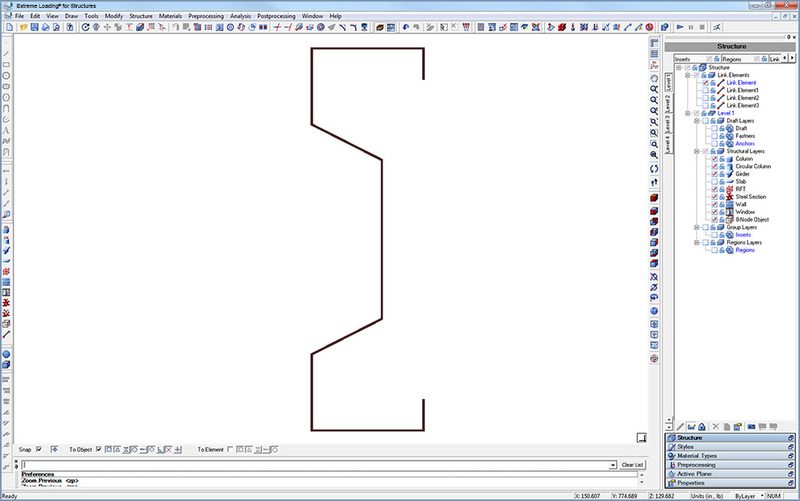 ELS can automatically re-mesh sections with irregular meshes due to cutting. 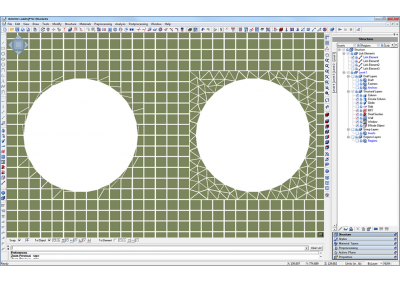 Create models for multi-layer glass sections using the enhanced glass styles. Convert standard reinforcement bars inside concrete sections from springs. 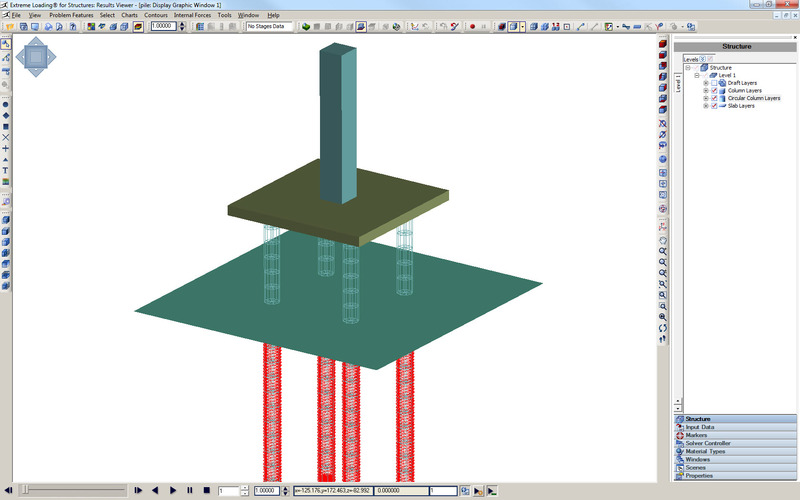 Model the interface between piles & foundations with surrounding soil without the need to model the ground as elements. Model cold-formed steel with a complete library of light steel framing studs and track provided courtesy of The Steel Network, Inc.
Model Corrugated Sheet Sections from a complete database. 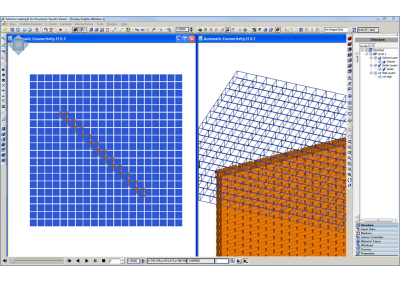 Simply create hollow tubes and pipes using drafting lines and selecting mesh properties. 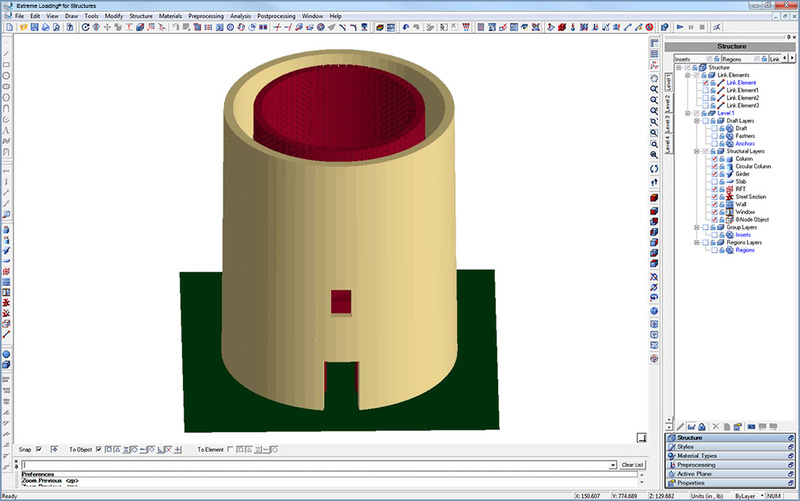 Model layered masonry stacks with staggered or standard bricks. Model from library of light gauge steel stud sections. 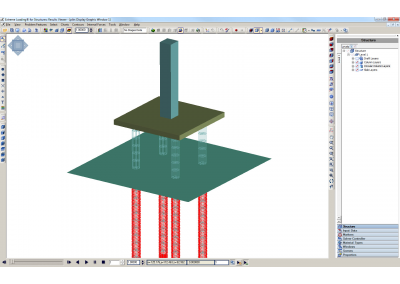 Full 3-D Modeling: build and modify your models in a 3-D environment. Style Based Modeling (Building Components): saves time by allowing the user to use standard building components or edit and create new ones for streamlined modeling. Steel Section Library: complete library of ASIC & UK/European metric and imperial steel sections. 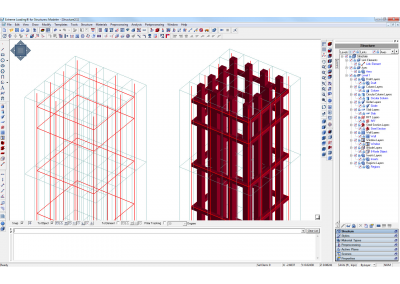 Columns: create standard steel, concrete or reinforced concrete columns or circular columns and customize dimensions, mesh type, material, and embedded reinforcement or steel section style. 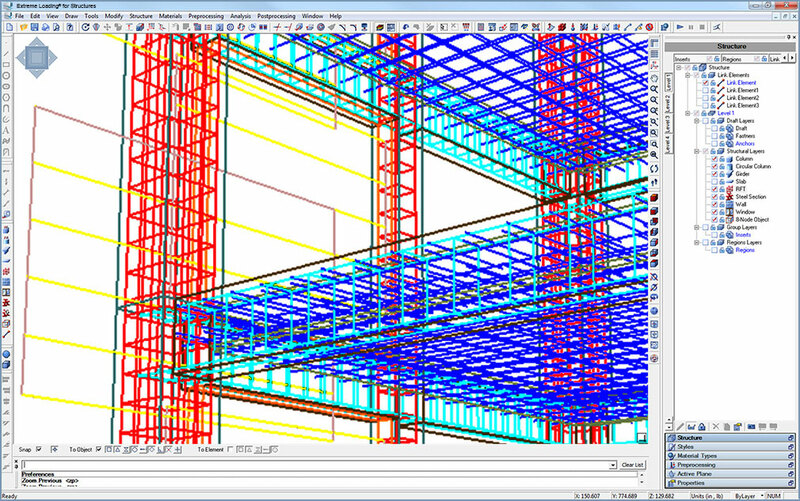 Girders: customize girders by depth, material, and embedded reinforcement or steel section style. 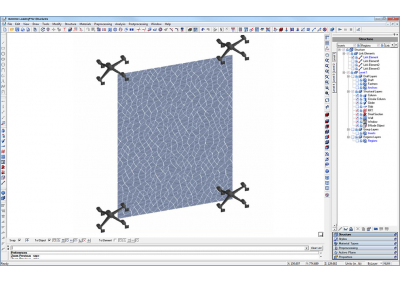 Slabs: customize slabs by depth, material, and embedded reinforcement or steel section style. Masonry Walls: customize masonry walls by thickness, separate brick and mortar materials, with a normal grid or staggered brick pattern. 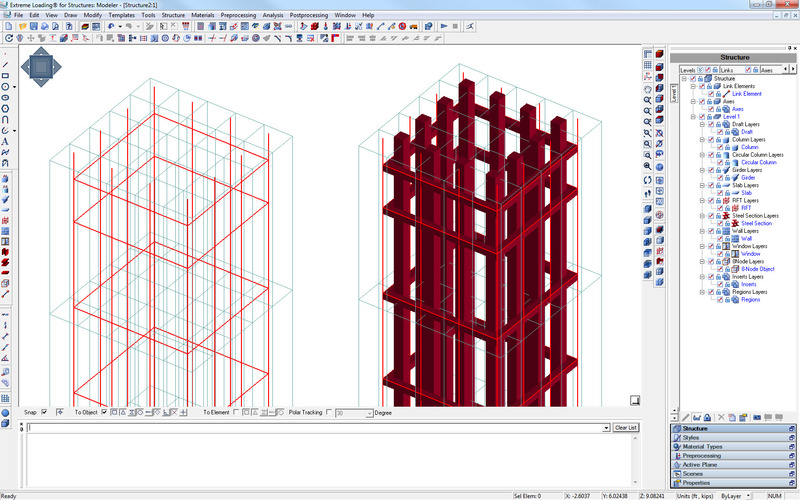 Multilayer Windows: create models for single or multi-layer glazing sections with frames and mullions. Reinforcement: model custom reinforcement bars, variably spaced stirrups, and steel sections. 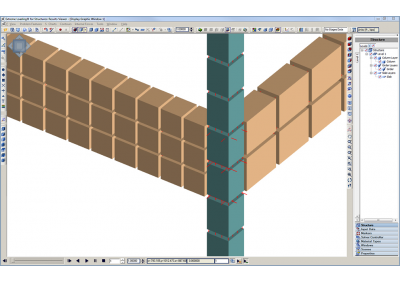 Create custom names for reinforcement bars styles custom names and import/export data bases for bar sizes. 8-Node Objects: create custom 8-node objects. 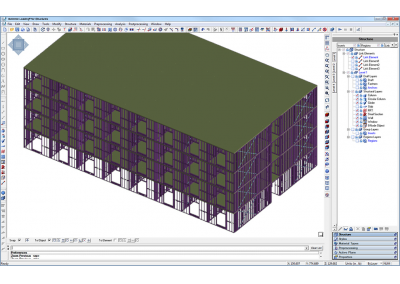 Structure Templates: create models for multi-story structures, frames, trusses, towers, domes, light steel framing walls, hollow core slabs, corrugated sheet, stairs, and segmental bridges. 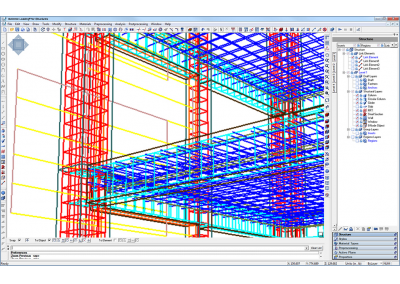 Convert Draft Objects: draft objects and convert into girder, masonry wall, RFT, steel section, link members, column & girder structure, steel section component, or polyline. 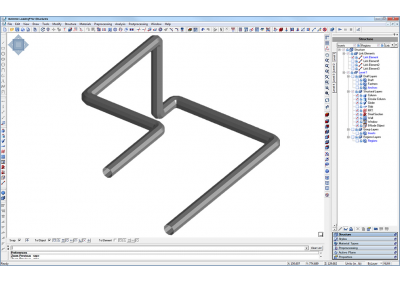 Enhanced Modeling of Steel Bars: Automatically convert reinforcement bars inside concrete sections from springs to physical elements for enhanced modeling of steel bars. 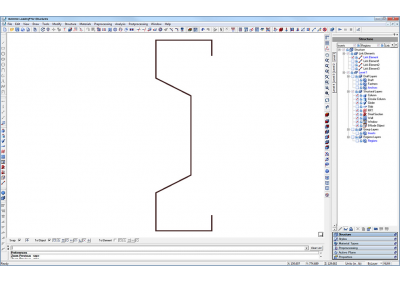 Create Hinges: The ability to create intermediate hinges inside and between columns and girders. Interface Materials: Specify custom-created interface materials and specify a custom name using the enhanced Interface Materials dialog. Extrusion & Revolution: create objects using the extrusion or surface of revolution commands. 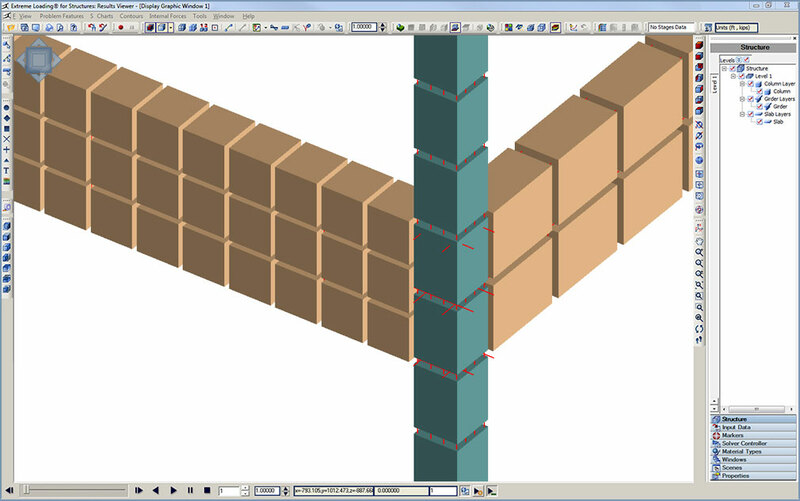 Pre-stressing: apply pre-stressing in reinforcement bars and link elements. 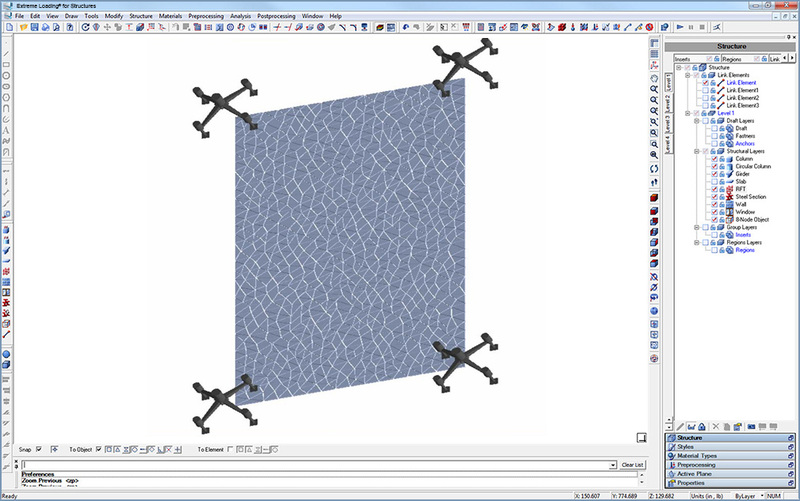 Cracks & Hole Tool: model pre-defined existing cracks or holes in structural components. 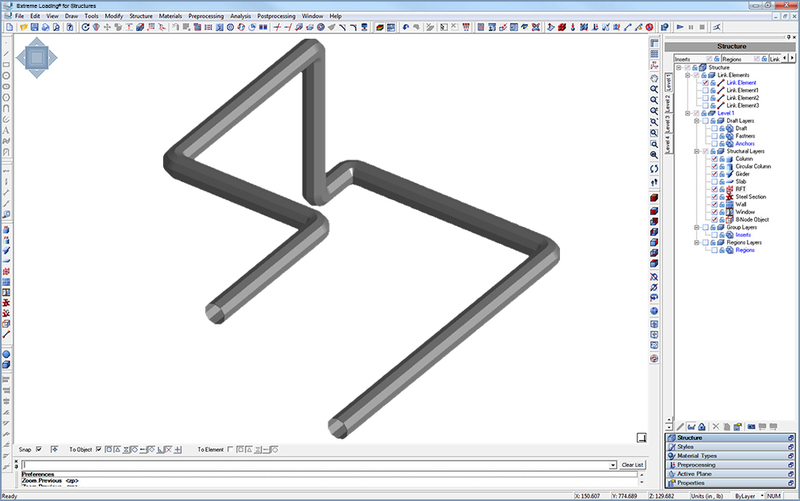 Hollow Tubes: simply create hollow tubes and pipes using drafting lines and selecting mesh properties. Command Line Settings: define custom command line shortcuts. Filtration Queries: create custom filtration queries based on complex criteria (Object Type, Material,Interface ID, Pre- Stressing, Loading, etc,). Import & export queries for common tasks. Automated Model Reports: create a document that includes screen shots of the model, material model, reinforcement bars, styles, loading stages, and all data used to build the model. The user has the ability to customize views. The report is generated in HTML format and can be printed easily into PDF. 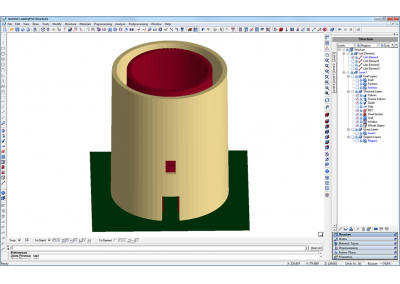 Active Planes: Specify active planes to simplify creating 3-D models. 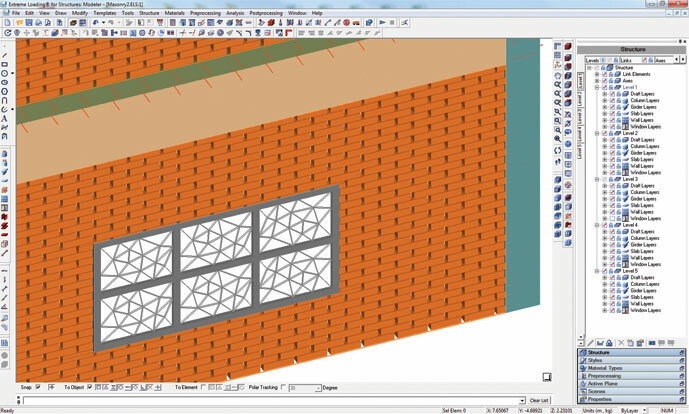 Enhanced Window Options: Create multiple windows with cascade and tile options or dynamically view your model using snippet view. Enhanced Show/Hide: select, show, and hide objects using multiple filtering criteria. Pick Command: specify the coordinates of any point you need by simply selecting it using the pick command available in all dialog boxes. 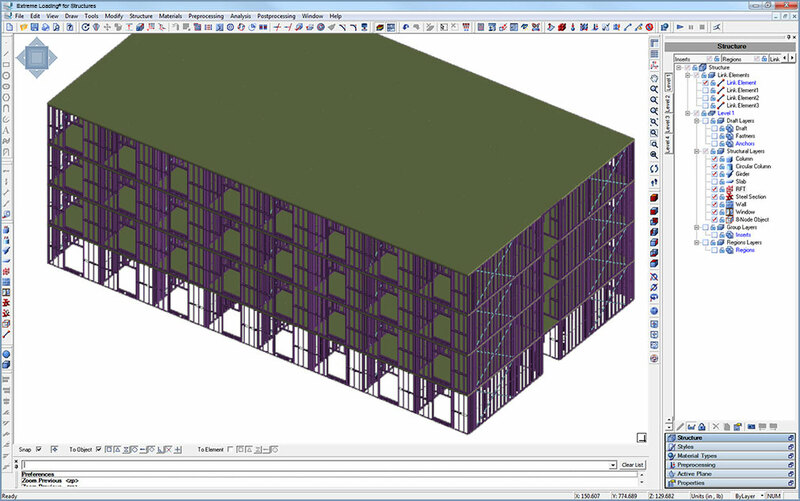 Copy Format: copy structural objects with assigned loads and boundary conditions. Multiple Level Arrays: generate multiple copies of levels. Snap Options: helps you build your model quickly and accurately. 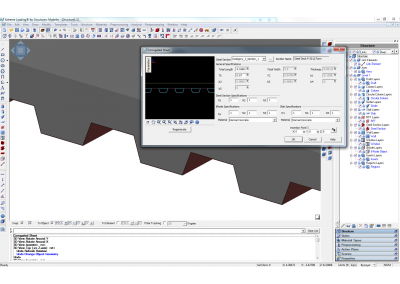 Smart Recognition: helps the user convert lines and shapes either imported or drawn into the modeling window to three-dimensional structural components. Model Pile Interface: Ability to model pile interface with surrounding soil without the need to model the ground. This enables the soil-structure interaction to be considered without the need to include huge number of elements for soil. Import/Export ELS Files: allow users to import and export al or part of an ELS model from one ELS file to another. Import Draft Objects: allows user to import draft objects or reference and conversion into objects. 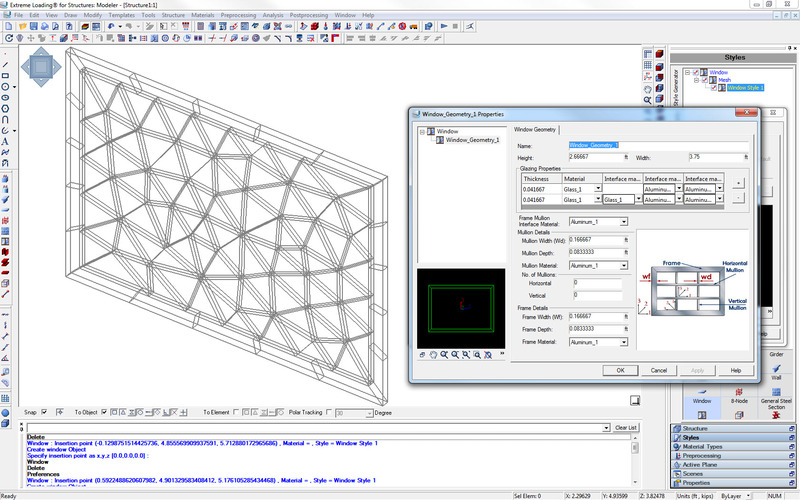 Re-meshing: re-mesh element selections into square or voronoi (random triangle) shaped elements to enhance and optimize element size and shape. 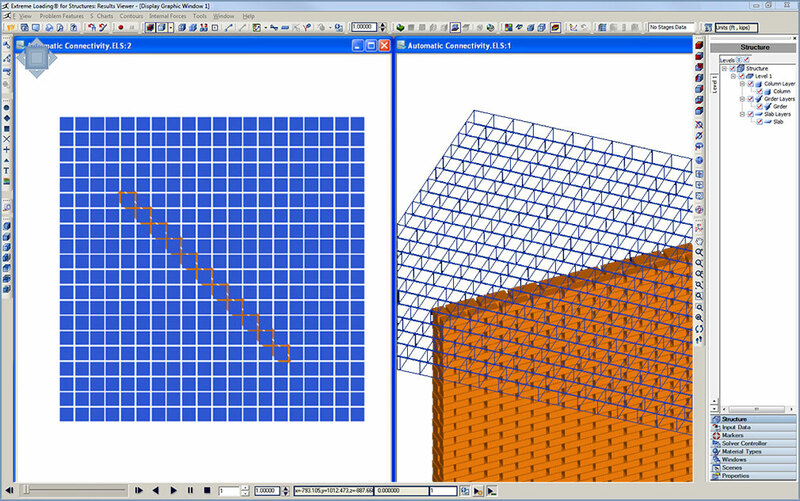 Automatic Mesh Adjustment & Element Connectivity: element connectivity is generated automatically by the program without user-intervention. 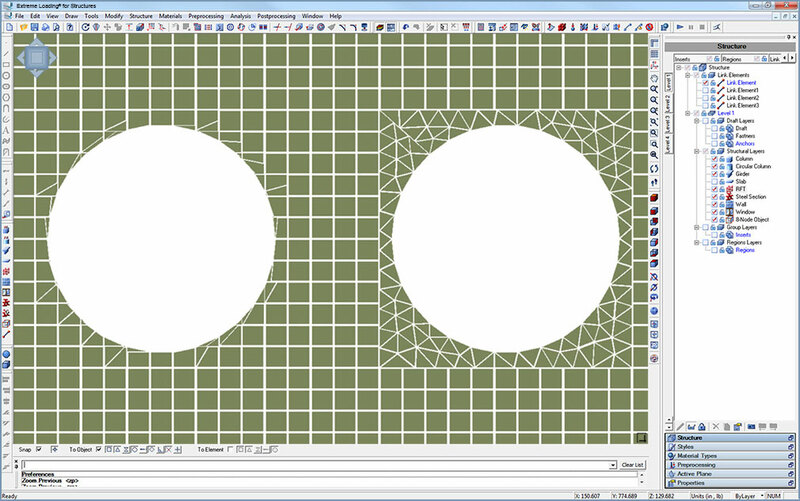 Re-meshing to create transition elements is not required. This saves precious time typically lost due to complex connectivity issues. Automatic Formation of Plastic Hinges During Static & Dynamic Loading: the user is not required to make assumptions about which areas are prone to failure as this is determined automatically by the program. This saves time typically lost during trial and error processes.